TCi furniture WORKS engaged with Multiplex Construction Europe Ltd to supply and install site setup furniture at this prominent development in the City of London. 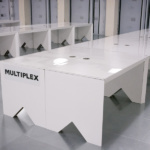 Multiplex have a strong commitment to sustainability, underpinned by their environmental management policies to keep a closed-loop approach to material procurement and waste management and so naturally sought an environmentally friendly alternative to the usual solid wood desks we see in offices. The office furniture installation has included more than 150 workstations, operators’ chairs and meeting tables, saving significantly on the use of natural materials. In addition, the newly appointed project office features 79 ECO360 100% recyclable, sustainable cardboard desks. The environmentally friendly workstations allow for easy disposal and recycling of major office furniture components. ECO360 is manufactured from majority recycled FSC® board and comprises a recyclable, transparent acrylic work surface and premium ABS cable port. Furthermore, delivery of the desks has been carbon-offset via a UK tree-planting scheme. 100 Bishopsgate is a 2-acre site in London’s historic financial district, a short walk from Liverpool Street station. The striking design incorporates a forty story tower and seven storey podium which will feature a green roof terrace. The project will provide 860,000sqft of office space and joins 30 St Mary Axe as a feature on the London skyline.